Find a variety of gorgeous blooming branches at FiftyFlowers.com! 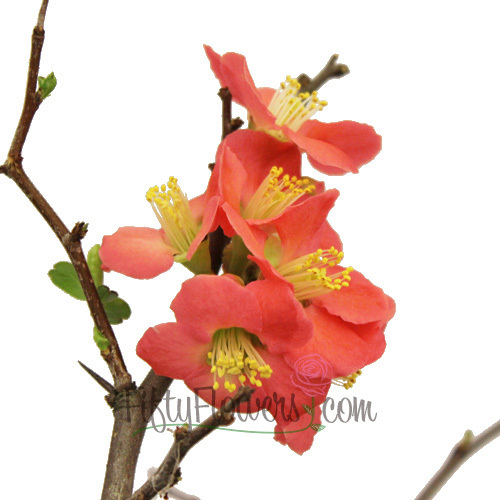 Blooming Coral Quince Branches are fresh, natural branches that are adorned with delicate coral blooms perfect for creating stunning, tall centerpieces. Offered in bunches of three, and at three different lengths, these branches are wonderful statement pieces. If your event is on a Saturday the suggested delivery date is two Thursdays prior. This date depends on the blooming stage of the branches during the time. Branches are shipped in a grower’s bunch of 6 to 9 stems and typically arrive in industrial plastic bags. Blooming branches will arrive with closed and opened blooms. If you order the 9 pack of branches, you will receive 1 bunch FREE for extra. Branches are a product of mother nature and will vary in shape, form, and hue. The branches sold in this package are natural and each will have a unique shape and form. These branches come with coral pink blooms with orange undertones. It is important to monitor the bloom stage of the branches so they are perfect for your wedding date. If they are tighter than you desire, keep in a warm room around 75 degrees. If they are at a stage you like, then hold them back by keeping them in cool room with no direct sunlight. * Package contents and prices are based on availability and are subject to change due to weather and market conditions. These branches are closely monitored to ensure the best delivery date for your event.